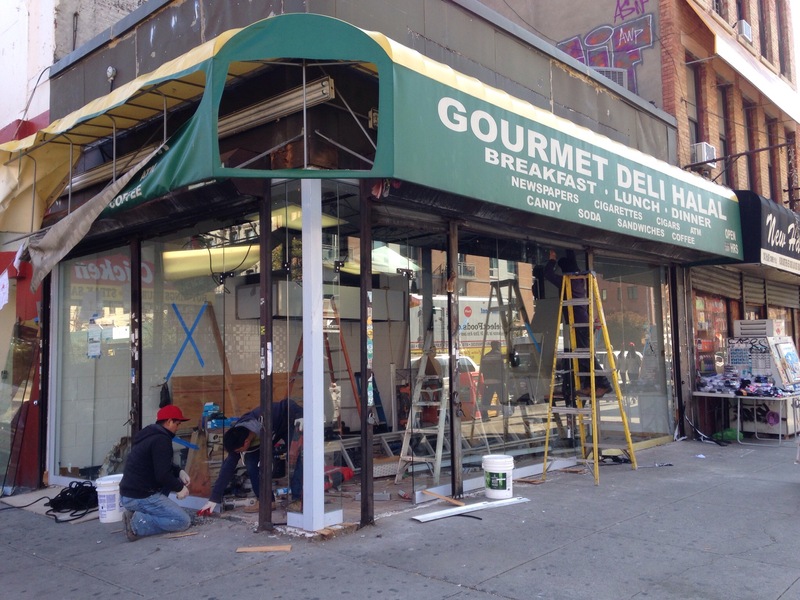 Corner bodega in Harlem to become new home for Kennedy Fried Chicken and Pizza | HarlemGal Inc.
Frederick Douglass Blvd in Harlem, it’s rumored to be the new home of next door Kennedy Fried Chicken and Pizza. Apparently, they want more space and prominent location. This should please my mother and nanny. They love this place for its inexpensive hamburgers and fried chicken. It’s also a place with good ethics. My daughters’ nanny left her wallet in there a few months ago unknowingly. My babysitter thought she left her wallet somewhere else. Fast forward to several months later, my nanny walks into Kennedy’s to purchase food and the owner says to her, “where have you been? I have something of yours!” It was my nannys’ wallet with everything intact, cash, credit cards and metro card, etc. For my daughters first birthday party, I made sure to buy all the boxes of pizza from there! Good work ethic and decent food, deserves good business. Stay tuned for Kennedy’s opening at their new location on 116th and FDB in Harlem. This entry was posted in 116th Street, business, Community, food, Frederick Douglass Blvd., Harlem, Harlem bloggers, Harlem blogs, Harlem businesses, Harlem restaurants, HarlemGal, kids, Things to do in Harlem, Where to dine in Harlem, Where to live in Harlem. Bookmark the permalink. This is terrible news, Kennedy Fried chicken is a dump and a blight on the neighborhood. We got eat!! There very nice there. When it’s late and I’m on FDB Row and everything is close, that’s my first place to stop when I’m hungry. This is a great avenue with excellent restaurants and nice shops. It’s a shame this prominent corner will be taken over by such a dump. I was hoping for something nicer.